When everything about your car is working as designed, you pay it no attention. At the first sign of a problem, whether the check engine or other warning lights come on, or your engine cranks but won’t start, you lose all trust in your vehicle’s ability to operate safely. It’s critical to get your car professionally diagnosed, no matter the problem. New Concept Auto Service has 30 years of experience performing accurate car diagnostics for the residents of Overland Park. 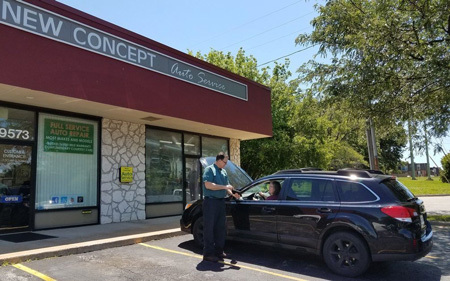 Our honest, reliable team holds the knowledge and experience to precisely troubleshoot the root cause of your concern— while providing you with the utmost in customer service. The technicians at New Concept Auto Service are all ASE-certified master techs, with two holding the highest level of certification, L-1 (advanced engine performance). This means we have mastered the science of car diagnostics on virtually every system, from troubleshooting electrical issues on your Ford Fusion, ABS braking problems on your Toyota Corolla, or check engine light diagnosis on your GMC Terrain. Once we’ve diagnosed the root cause of your car’s issue, we’ll discuss a detailed repair plan with you, ensuring you know exactly what repairs are required once the car diagnostics are complete. We perform only the work you authorize, while always using original equipment and high-quality aftermarket parts for dependable repairs. Honest. Accurate. New Concept. Call us or use our online appointment form to schedule your car diagnostics today! At New Concept Auto Service, you can rest assured that an ASE-certified technician is working on your car diagnostics. We have the expertise and training to repair any concern that pops up, from fluid leaks to worn out parts. We perform car diagnostics on all domestic and import models, regardless of the vehicle’s age. We have the necessary diagnostic tools and the repair technology to efficiently and accurately perform your car diagnostics right the first time. It can be inconvenient trying to coordinate your car diagnostics around your school classes or work, so we work around your schedule to make your visit as hassle-free as possible.